The list is expected to be out after a meeting of the central election committee headed by Congress president Sonia Gandhi. 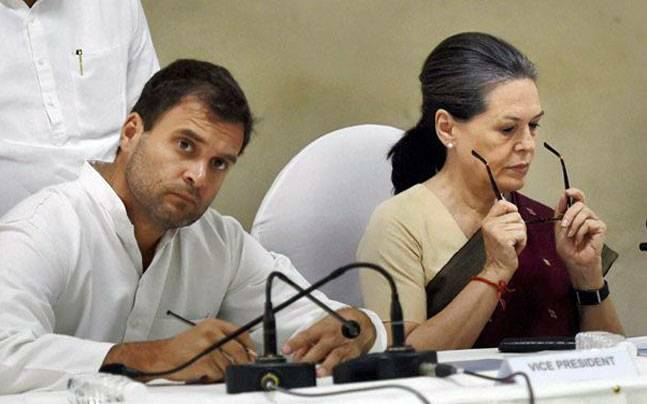 File photo - Congress vice president Rahul Gandhi with mother Sonia. The first list of Congress candidates for the upcoming Himachal Pradesh Assembly polls is likely to be out today. According to party sources, the central election committee (CEC) is likely to meet today morning at 10, Janpath, residence of the Congress chief. Former Prime Minister Manmohan Singh, Congress vice-president Rahul Gandhi, party's general secretary in-charge of Himachal Sushil Kumar Shinde are also expected to attend the meeting besides incumbent Chief Minister Virbhadra Singh and party's state unit chief Sukhvinder Singh Sukhu, the sources said. "The panel will meet to decide candidates for the crucial polls on Wednesday. Majority of the candidates will be finalised by Wednesday itself. There are some seats, candidates for which are likely to be decided later. This is because there has been no consensus on whom to offer the candidature," a source said. Singh has already been declared as the party's chief ministerial face and the campaign committee head for the November 9 Assembly polls in the hill state. He is likely "to have his way" in the selection of candidates, the sources said. The party's Screening Committee is headed by former Union Minister Jitendra Singh. It would decide on the candidates, on the basis of the recommendations made by the Pradesh Election Committee (PEC). The PEC has already given 42 single names for as many seats while giving a panel of names for 26 remaining seats. Singh has said that "winnability" was the only factor for distribution of party tickets but did not answer whether the "one family one ticket" formula would be made applicable in the state. The formula was successfully implemented in Punjab earlier. The chief minister confirmed that his son Vikramaditya Singh will contest from Shimla Rural constituency, currently represented by Singh himself. He said his son has every right to contest as he is the Himachal Youth Congress chief. Minister Kaul Singh Thakur is demanding a party ticket for his daughter Champa from Shimla while another minister G S Bali is also asking a ticket for his son. Asked if all sitting MLAs will be repeated, Singh said almost all except a few, who have opted out. Sources said that Vidya Stokes, Viplove Thakur, Harsh Mahajan and Sukhwinder Singh Sukhu have stated before the Pradesh Election Committee that they do not wish to contest. The sources also said that four senior leaders Virbhadra Singh, Asha Kumari, Mukesh Agnihotri and Bali had not applied for a party ticket, but the State Election Committee has asked them to contest and recommended their single names. Sources added that the chief minister will contest from either the Theog seat or from Arki seat, near Shimla.